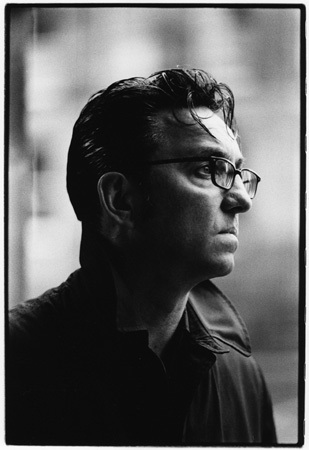 Richard Hawley (left), denizen of Sheffield and purveyor of guitar baritone romance and melancholy is difficult to match. We were quite late to the party and had to wait even longer to get to see him. His first words when he came on stage were “we’re back!” For some, maybe. He played for getting on 95 minutes with his band Shez Sheridan (best mate and guitar), Dean Beresford (Drums), Colin Elliot (bass) and Jon Trier (keyboards and known to Hawley as the Librarian). Good value, if nothing else. With a new album to plug, one might have expected a full track listing. 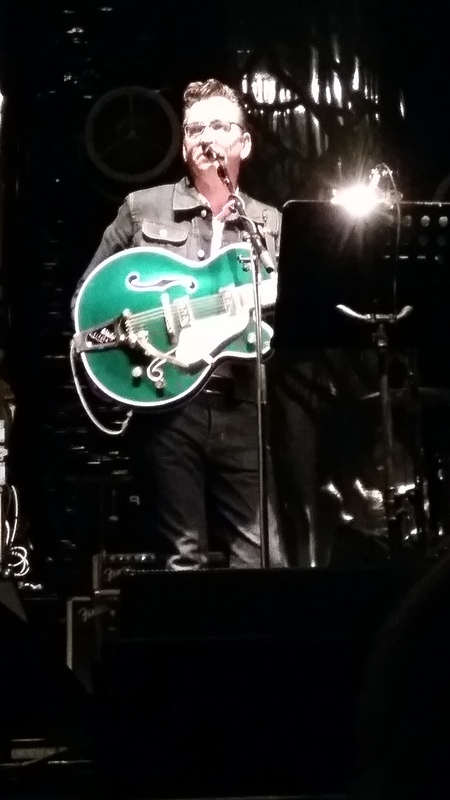 But this is a rather humble and knowing Richard Hawley. We were treated to the full range across the repertoire and the six-and-a-half albums of which I have four, including his latest, Hollow Meadows. He dedicated to his audience a track from Hollow Meadows, Heart of Oak, as a metaphor for his loyal followers. That was nice. We were treated to the romantic hits, Open up your Door (from Truelove’s Gutter), The Ocean (from Coles Corner) and Tonight the Streets are Ours (from Lady’s Bridge). For those in the audience wanting louder – and the audience was a shade vocal, almost hecklers at one point – got a good chunk of his very loud album, Standing at the Sky’s Edge including the title track, She Brings the Sunlight and the quieter Don’t Stare at the Sun. This is an album, so loud is it, that one needs a lyric sheet. If you want loud, this is the section of the gig for you. So, the music was great and sustained. The banter good natured. But the care with which the set was played impressed me no end. Hawley has a guitar dresser or caddy (as golfers have). The said character was a wisp-like man in jeans and a tee-shirt armed with a duster and a keen ear for tuning. Each of Hawley’s guitars (at least eight) got his tender loving care. Tuned to perfection and the dusted so that they sparkled in the lights. Hawley’s attire is equally choreographed. It might only be a pair of jeans and denim jacket. But it is an ironed pair of jeans and denim jacket. I wish I was as advanced as the product developers at Marlboro (bottom rigtht) and Lucky Strike (left). Is this the innovation equivalent of vinyl to cassette in the music industry (i.e. not really)? 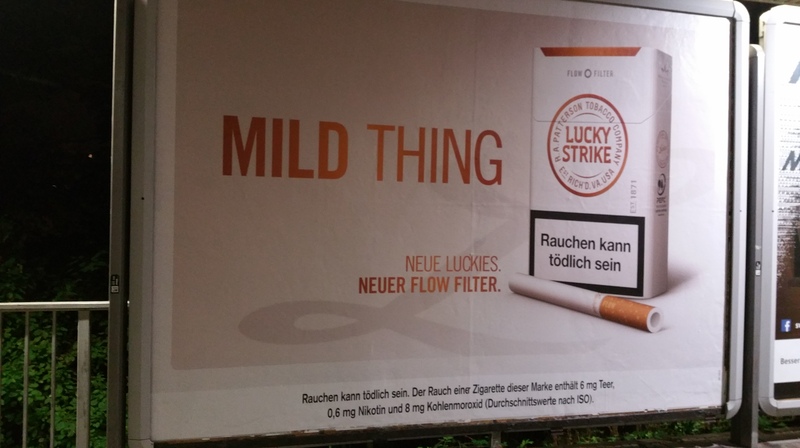 So, there are new filters on the market delivering “a cleaner taste” (Marlboro does not even bother to accommodate the language of the smoker, in this case German) and mildness through a “new flow filter” (Lucky Strike). It does seem that the designers of the Marlboro poster did not trial it properly. 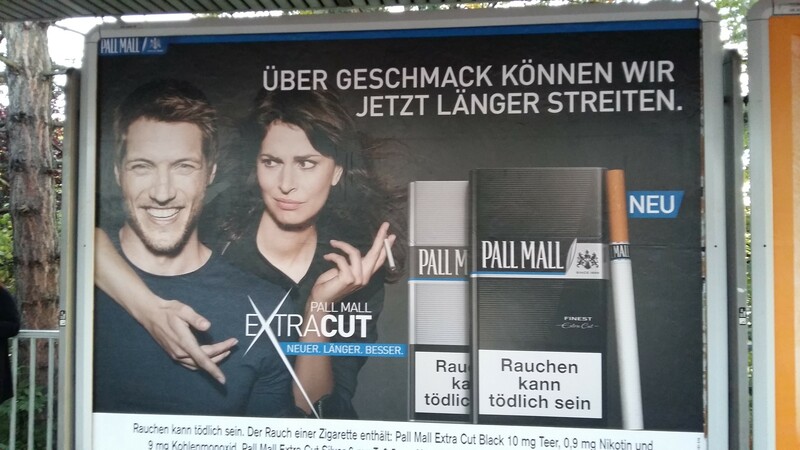 On this example, if the poster is not perfectly pasted on the billboard, it does not matter how advanced the filter, the cigarette itself seems a shade, what can I say, bent. 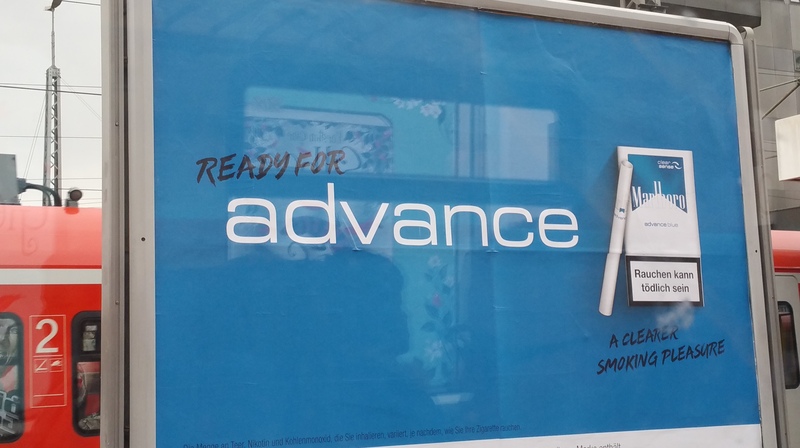 Never mind, advanced cigarettes are just as effective at delivering death as their predecessors. 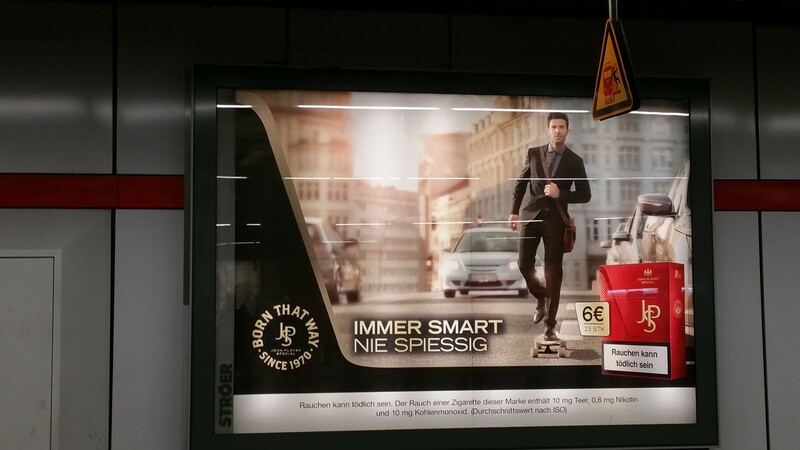 Talking of John Player, here’s the latest offering from the JPS brand’s autumn campaign. As if smoking is not enough of a death wish, this bloke (wearing his suit and satchel) is smoking whilst on a skateboard on a busy road probably following lots of VW diesel cars just to show how cool he is. 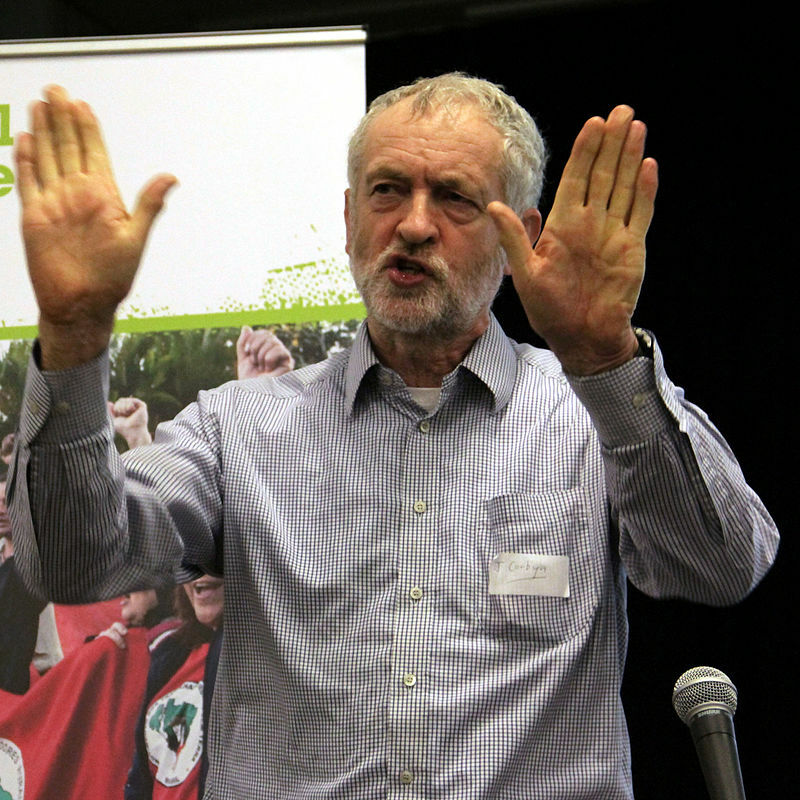 To make matters even worse for the brand, its own strapline is “Born that way…” Indeed! The main route heading north and east is a delight. 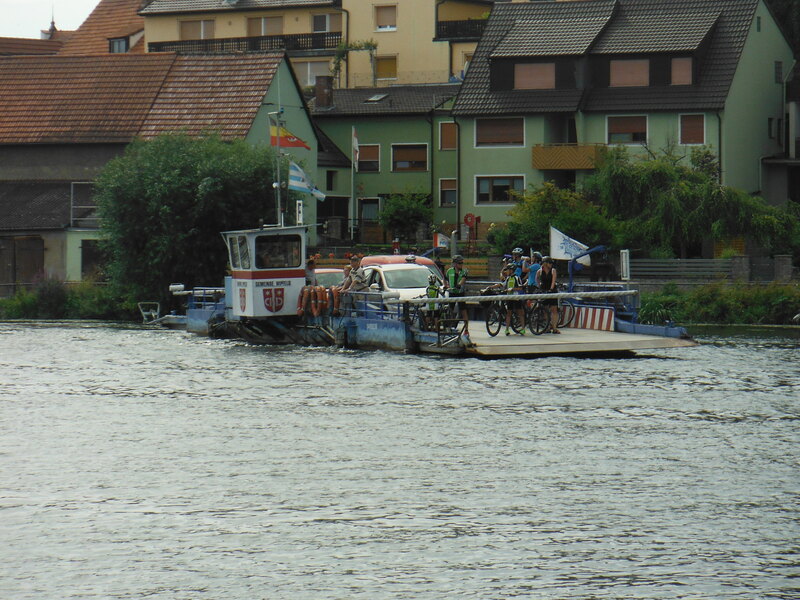 It is still significant enough to experiece ferries and sizeable bridges, some of which riders are required to use. We travelled in a northerly direction towards Dettelbach. This is very much wine country and Dettelbach (below right) is twee and offers a considerable – and probably necessary – marketing opportunity for growers. They have hostelries on the road side with opportunities to sample the local wine and then buy a crate. We acquired a taste for Domina (a fruity red) and Spätburgunder (another word for Pinot Noir). Suffice to say, we did not carry a crate on the tandem. We actually stopped at Volkach for lunch where, clearly, we should have stopped at the St. Maria im Weingarten church, the home of another Riemenschneider carving. But we hadn’t done our homework. However, by way of compensation, and as is so often the case, one stumbles upon strange – sometimes inexplicable – attractions. 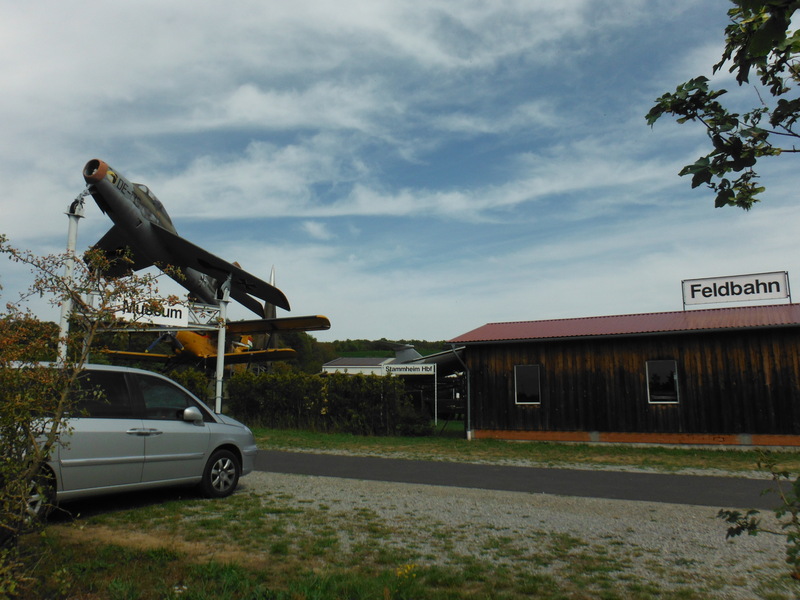 So at Stammheim, one encounters an air museum (left). And a ferry. I love ferry rides across rivers (below right). 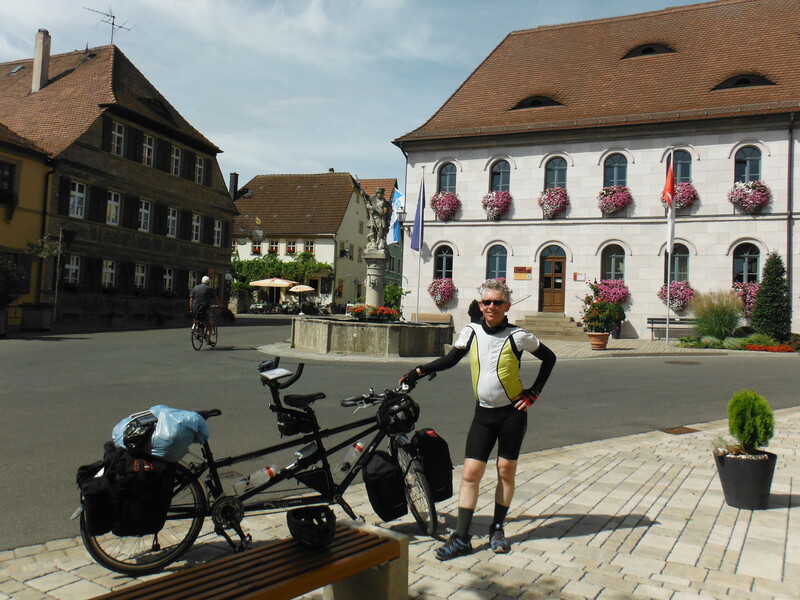 Onward towards Schweinfurt which is a not insignificant industrial town. It produced most of the Nazi war machine’s ball bearings. For that reason it was a target of allied forces in 1945. It retains significant metal industry facilities. But if one follows the track, the city is largely bypassed. 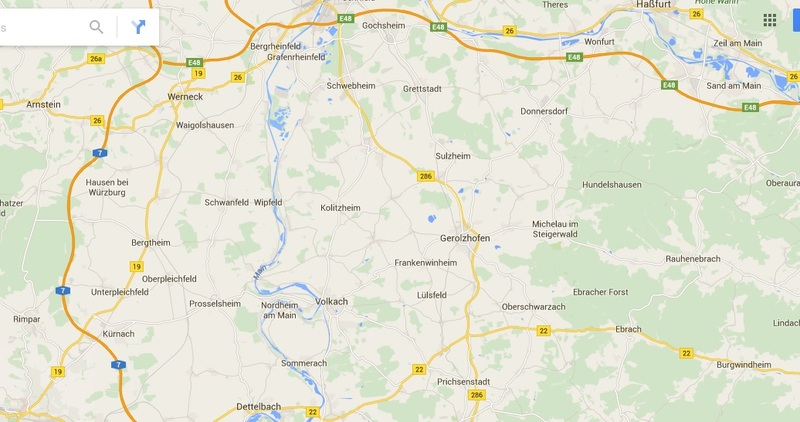 Next up is Haßfurt, again somewhat bypassed. We were keen to get to our preferred campsite at Sand am Main. We took a little detour adjacent to an airfield, surprisingly busy with small and micro aircraft. Sand am Main proved not as easy to get to as we might have thought. 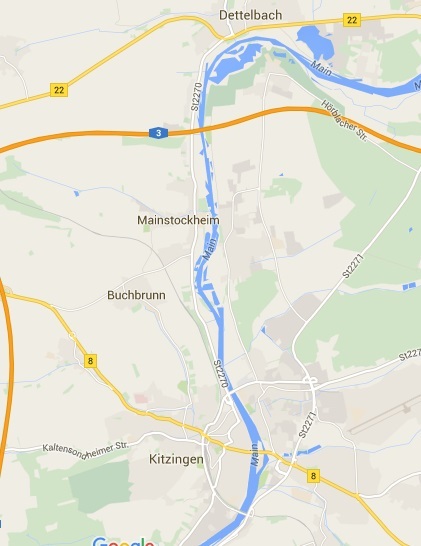 There is a lot of water which requires one to ride over the correct bridge just to the east of Knetzgau. The campsite is actually on the banks of Sanderbaggersee and is, consequently, relatively easy to find once in Sand. Time for a day off from the tandem. The next day we walked into the nearby Zeil am Main (left), a centre for furniture manufacture, and caught the train into Bamberg. 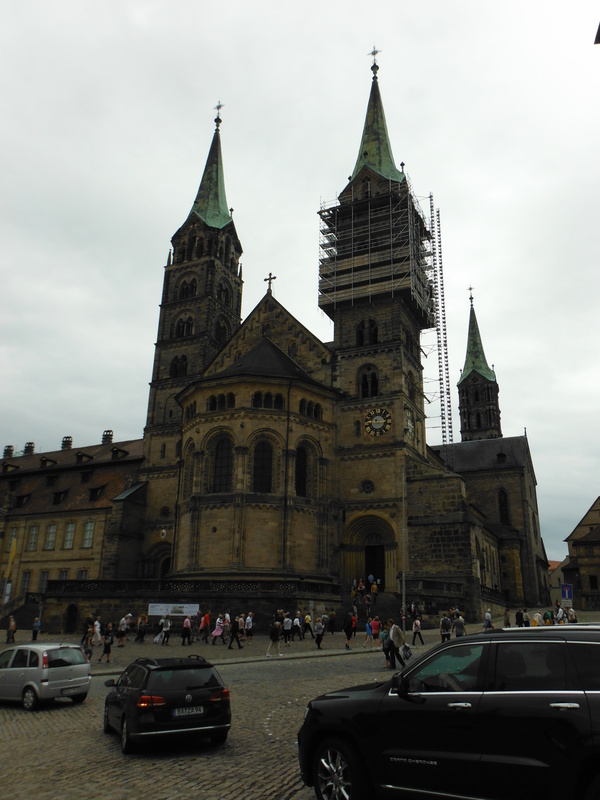 Bamberg – or at least its centre – is a UNESCO World Heritage Site. And it is extraordinary. It has a thousand years of history, much of it religious. It lost its status as a city state in 1803 becoming part of the Bavarian kingdom. It is certainly a hilly place (there are 7 hills, die Hügel), thus enjoying the architecture requires some strenuous walking. The stone used for the buildings gives it an unwarranted industrial feel. 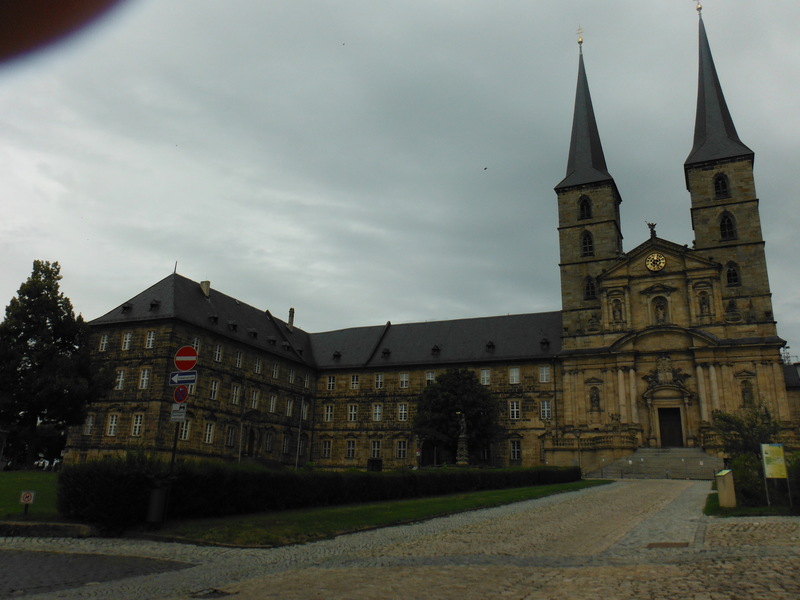 The Cathedral (right) is, for example, built from a sandy-coloured stone, as is the nearby Michaelsberg Abbey (below right). The cathedral dates from the 13th Century and is described as romanesque (Bamberg is often described, inappropriately, as Bavaria’s Rome). 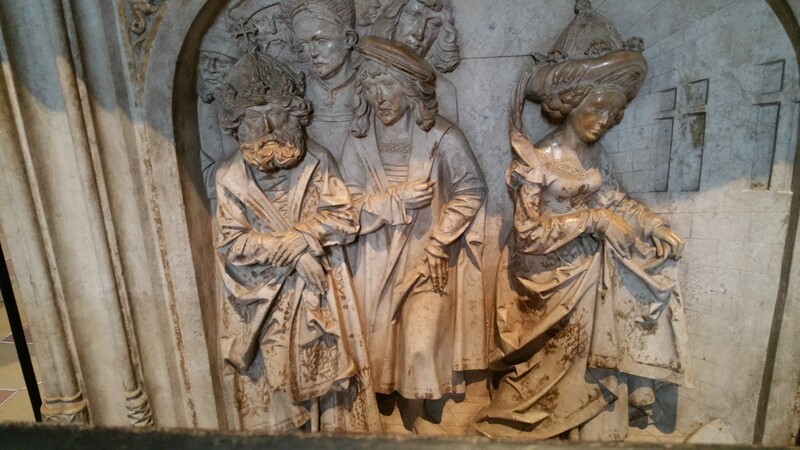 As for the interior, one can find an ornate Riemenschneider tomb sculpted from marble (left). It was sculpted for Heinrich II and his wife (Kunigunde), and dates from the early 16th Century. It is adorned with carvings capturing a series of complex stories. For example, Kunigunde was challenged on her faithfulness to the King (left). She was essentially cleared after proving her faithfulness by runing over some hot sharp metal without injury! Bamberg also has a history steeped in beer, not unlike most Bavarian towns, it has to be said. There is one very special beer, however, that had to be tried. 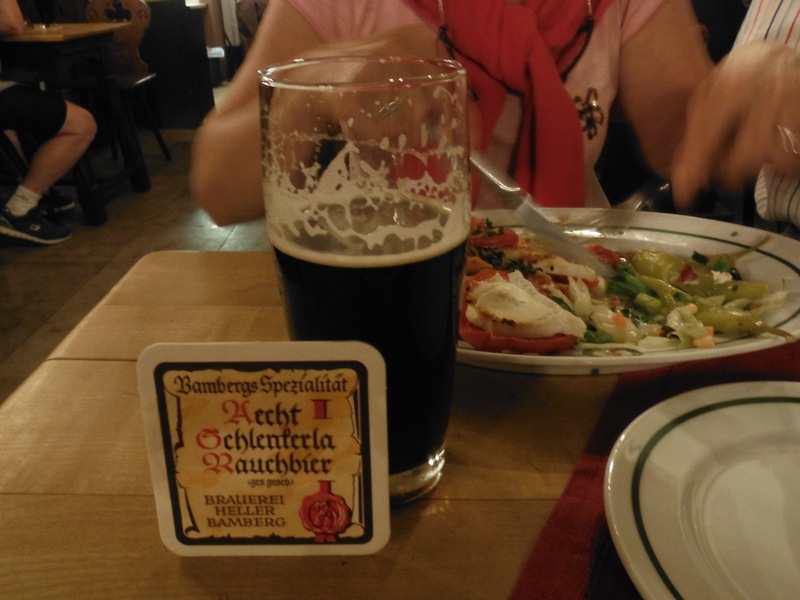 That beer was Aecht Schlenkerla Rauchbier (essentially, dark smoked bier). The beer is smoked arising out of an accident. Fire damaged the brewery and soiled the ingredients including the hops. However, waste not want not, as-it-were. The next batch of beer had, not surprisingly, a smoked flavour. I have to say, one glass was enough. The hostelry itself offers traditional complementary food which is quick (the turnover inside is rapid) and surprisingly good, even for a vegetarian.